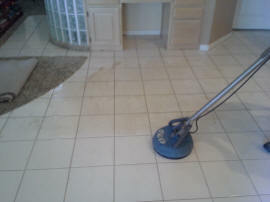 Our tile floor cleaning and grout cleaning services are exceptional and environmentally friendly. By utilizing our state-of -the-art cleaning system, that heats the water up to 240 degrees Fahrenheit and generates pressure of over 1,000 PSI, there is no tile cleaning job that we can not handle. Because of the high temperatures and pressures we can achieve, our process kills and removes embedded bacteria, stubborn stains, and harmful contaminates that are in embedded in your tile flooring. Whether your floors are ceramic, porcelain, Mexican tile, granite, marble, slate, travertine or even terrazzo, we know how to properly clean your floor without harsh or toxic chemicals left behind. Mopping does not get your tile or grout clean enough and scrubbing, besides being tedious and labor intensive, cannot remove the dirt and oils embedded in the grout. Since grout is highly porous, scrubbing your tile and grout can further embed the dirt and oils into the pores of the tile and grout leaving your floors with a yellow, brown, or dirty look, even though you just cleaned. With our high-pressure equipment high temperature equipment, we can remove the grime buildup and other contaminants that sit inside your tile and grout surfaces. 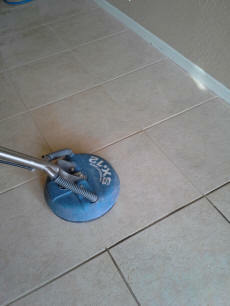 Our SX-12 blasts soil and dirt from tile, grout, and smooth or rough surfaces. The rotary arm spins to create amazing soil blasting power. At the same time the vacuum ports pick up all the dirty water back to our BIG Truck’s disposal tank. This is all done under a Roto Molded disk that gets all its powerful steaming hot 240 degree water, 900 pounds of pressure, and over 1000 CFM of vacuum from our industrial truck mounted mobile cleaning unit. 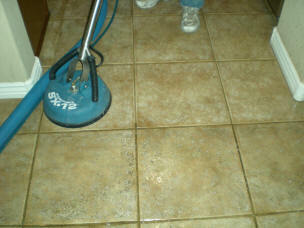 These temperatures and pressures are not achievable by any portable machines or budget tile cleaning companies. 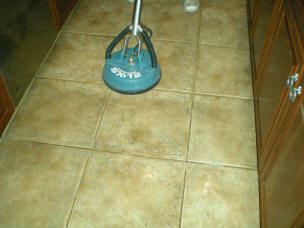 Note: The pictures on this page are from actual homes we have cleaned in Peoria, AZ.